...For SEASONED Music Lovers. 50s, 60s, 70s, oldies, classic rock, rockabilly, jazz, bluegrass. ...A little bit of everything from the 60s to 00s. King Crimson, Richard Thompson, Neil Young, The Monkees, Pete Townshend and more. 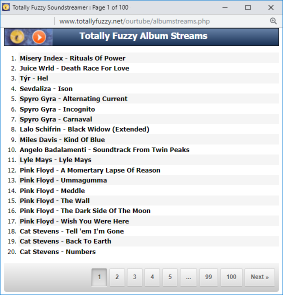 Full albums and sound buttons to hear BEFORE you download. ...One of the features in Beehive Candy, is Anorak Corner, remembering the music played by the offshore radio stations in Europe from the 1960's onwards. Add to that excellent quality bootlegs, encouragement to explore different musical genres, and you have the Beehive. ...Memories of the Top Hits of 1961-1970 Golden Oldies of the Baby Boomer Generation. ...Ochtendhumeur, nostalgie, verhaaltjes, plaatjes, originals, flauwe kul en... brede opklaringen. Music on my mind, Originals, Rarities, etc... from the roaring twenties to the abominable eighties.